Arjen Lucassen and vocalist Anneke van Giersbergen – who rose to fame with The Gathering – originally crossed paths in 1998 for Ayreon’s breakthrough third album, Into The Electric Castle. Ten years later they teamed up again for the seventh Ayreon album, 01011001, both having established themselves as world renowned heavy metal / rock artists in the decade between releases. Although their respective musical styles went in vastly different directions during that time, Arjen and Anneke retained a common ground that ultimately led to the creation of The Gentle Storm’s debut album, The Diary. The Diary double album – close to a year in the making – is an epic production of Ayreon proportions featuring two contrasting interpretations of the same songs, all composed specifically for The Gentle Storm: acoustic / folk arrangements (CD1 – Gentle) and bombastic / heavy arrangements (CD2 – Storm). It also heralds Anneke’s return to the realms of heavy guitars and soaring vocals reminiscent of The Gathering’s breakthrough album, Mandylion. Of course, it wouldn’t be an Arjen Lucassen project without his trademark progressive elements, but he readily admits his main focus was on Anneke’s vocals. The Diary breaks new ground for Arjen in particular in that it was the first time he worked with a large choir, real double bass, and a real French horn. In addition, he found people to play many different exotic acoustic instruments. “There are over 40, in fact,” he says. “Some of them so exotic that people probably haven’t heard of them!” It’s worth noting that, apart from an acoustic grand piano, there are no keyboards on The Diary. Arjen’s beloved Hammond organ and Minimoog remain under wraps, although it wasn’t an easy task leaving them there. Known for touring extensively year after year, Anneke is taking The Gentle Storm on the road backed by well known Dutch talents including former After Forever keyboardist / (Epica-)producer Joost van den Broek and Ayreon / Hail of Bullets / ex-Gorefest drummer Ed Warby. Arjen is not be part of the live line-up save for an exclusive appearance in Amsterdam at the official album release show on March 26th, 2015. He did, however, do a string of acoustic shows with Anneke through Europe in February 2015 out of respect for her and The Gentle Storm. 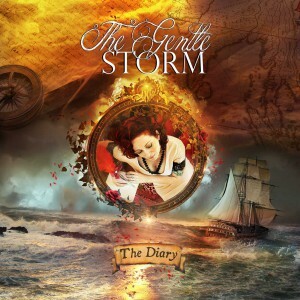 The Gentle Storm’s full band 2015 setlist consists of of songs from The Diary, as well as fan favourites from The Gathering, Ayreon and Devin Townsend Project records, all of which have featured Anneke prominently. The Gentle Storm is a live band!